Recently our friend Joe Notaro discovered several rare behind the scenes shots from The Grim Game in the book, Aviators in Early Hollywood by Shawna Kelly. Joe teased a shot of Houdini's stunt dummy on his blog, Harry Houdini Circumstantial Evidence. Now thanks to Marc Wanamaker of the Bison Archives, I can share with you the full original photo. 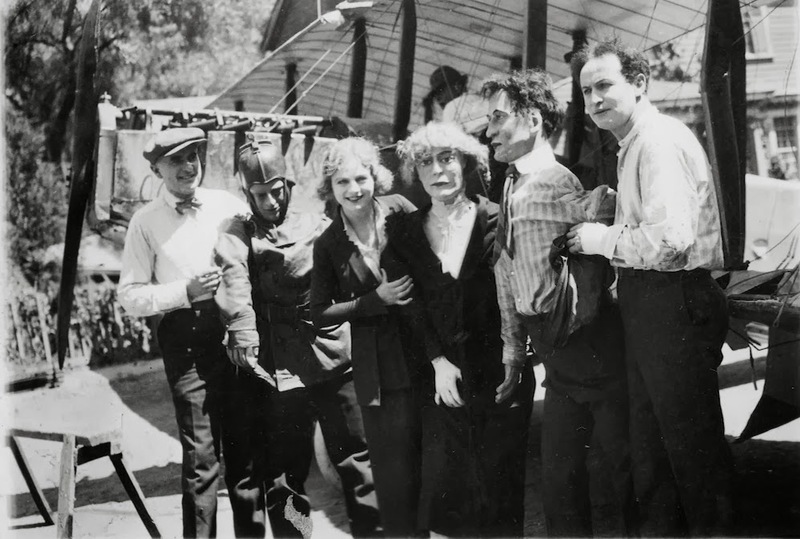 This shot shows Houdini and co-star Ann Forrest posing with stunt dummies used during production. They are standing in front of one of the bi-planes used in the famous aerial sequence. The Kelly book identifies the other man as Robert F. Kennedy, the stunt man who doubled Houdini in the aviation action. He is posing with a dummy used to double actor Clifton Allison who played the pilot, Augustus Phillips. All three dummies were used in the shot of the plane as it comes crashing down into a town square following the (real) mid-air collision. One thing that's interesting is you can clearly see the cast on Houdini's broken left wrist. Houdini had originally sustained the injury during the making of The Master Mystery. The wrist was broken in three places, and after being set, it developed adhesions on the joints and needed to be re-broken by a physician. Even after six months he had not regained full flexibility. He then re-fractured the same wrist when he took a fall from a platform while filming the jail escape sequence in The Grim Game. The injury delayed completion of filming by two weeks, and was the stated reason Houdini did not do the famous mid-air plane to plane transfer himself (possibly a blessing in disguise). Houdini's left wrist continued to give him problems his entire life. Even as late as 1926 the wrist was reported to be at only 50% strength and in traction. Thanks to Joe Notaro for helping me I.D. the third dummy, and to Marc Wanamaker of the amazing Bison Archives for allowing me to share this terrific image from the set of The Grim Game. Aviators in Early Hollywood by Shawna Kelly can be purchased on Amazon. Thank you John! I am so glad that Marc is allowing this incredible photo to be shared with all your readers. Amazing! Thank you John for posting this! Thanks all. It is a great shot, isn't it. Look how tall Houdini looks in this. And look how cute Ann Forrest looks. Hi John, just now getting around to identifying the other man in the picture; I believe it may be actor Augustus Phillips, who played Clifton Allison dressed as a pilot in parts of the film. Clifton Allison is Houdini’s boss and owner of the Daily Call, the only newspaper with aerial delivery. I am not sure that Robert Kennedy appears in any of the photos in the Kelly book.